Push-button spring action, knurled metal grip, removable pocket clip. Turquoise graphite leads (ordered separately) are tiny particles of electronic graphite (hardness, 6B to 6H), for use on paper or vellum. Prismacolor's Turquoise Leads fit the Prismacolor Turquoise Holder and other 2 mm lead holders. Tiny particles of electronic graphite provide denser, blacker, smoother writing leads. 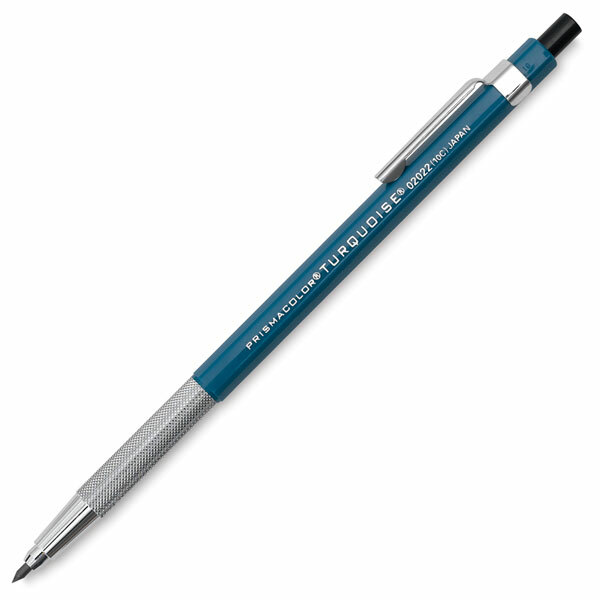 Turquoise Leads, for use on paper or vellum, measure 5-1/8" long × 3/36" (130 mm × 2 mm). Each box contains 12 leads of the same degree of hardness.